Ammar al-Beik is featured in the collective exhibition Zwischen den Welten – Between the Worlds at Schloss Roskow, Germany. Organised by Berlin-based art historian and curator Mark Gisbourne, Between the Worlds explores the lives of children whose childhood and transition into young adulthood occur amid the instability of war and political conflict. Al-Beik’s short film La Dolce Siria (2014) is among a range of works by artists from Syria, Cuba, Nigeria, France, Germany, Austria, and Spain. The exhibition is on view from 10 July until 18 September. Produced as a satirical response to Italian filmmaker Federico Fellini’s La Dolce Vita, the 23 minute-film uses the story of a circus as a metaphor for the current state of the artist’s native Syria. 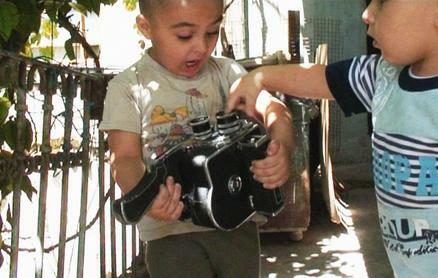 The simultaneous image of two small boys investigating a movie camera against a backdrop of bombs cements this allegorical narrative as the loss of innocence endured by war’s youngest victims. La Dolce Siria was shown at the Berlin International Film Festival last year.